As with golf, the game of Bowls owes its existence to the Scots. The rules are broadly similar all around the World. In 1892, the Scottish Bowling Association was formed and in 1893, it drew up rules or Laws based on Mitchell's Code and also published a Code of Ethics. The Scottish Bowling Association is now Bowls Scotland. In 1903, the English Bowling Association was formed, the first President being Dr. W. G. Grace, who is much more acclaimed and remembered for his fame as a cricketer. 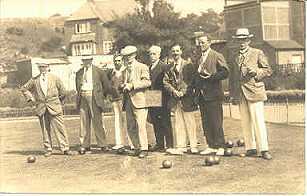 The International Bowling Board was formed in 1905, the foundation members being Scotland, England, Ireland, and Wales. New Zealand was first admitted in 1928, as also were Australia, Canada, South Africa, and the United States of America. The IBB is now known as World Bowls. It's believed that the "bias" was introduced inadvertently in 1522 by the Duke of Suffolk. Apparently his bowl split in two after striking other bowls and he took a knob off of a stairway banister post for a replacement. The flat side of the knob caused it to roll with a bias and he experimented by curving his bowl around others. The word spread and biased bowls gradually came into use. Interest lapsed for years until the wave of Scottish immigration to the US revived it in the latter part of the 19th century. The American Lawn Bowls Association (now Bowls USA) was established in 1915, more than a decade after the founding of the SFLBC.